A Palestinian youngster was killed in eastern Deir al-Balah in the central Gaza Strip. 342 civilians, including 60 children, 4 women, 6 journalists and 3 paramedics, were wounded; 14 of them sustained serious wounds. Israeli forces killed a Palestinian civilian and wounded 6 others in the West Bank. Israeli warplanes launched 2 missiles at the protestors and wounded two of them. Israeli forces conducted 84 incursions into Palestinian communities in the West Bank, and 6 similar ones into Jerusalem. 47 civilians, including 8 children, were arrested in the West Bank. 12 of them, including 2 children, were arrested in Jerusalem. Israeli forces attacked Coptic monks and arrested one of them. A 4-sotrey building, agricultural barrack and 3 water wells were demolished while 15 dunums were levelled and 2 mobile houses were confiscated from a school. Settlers caused severe damage to 8 cars. 6 fishermen were arrested in 3 separate shooting and chasing incidents while 2 fishing boats were confiscated. 13 civilians, including a child, woman and journalist, were arrested at the military checkpoints in the West Bank. Israeli violations of international law and international humanitarian law in the oPt continued during the reporting period (18 – 24 October 2018). 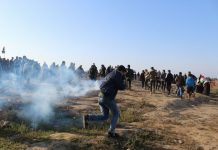 Israeli forces continued to use lethal force against Palestinian civilians, who participated in peaceful demonstrations organized within the activities of the “Great March of Return and Breaking the Siege” in the Gaza Strip, which witnessed for the 30th week in a row peaceful demonstrations along the eastern and northern Gaza Strip border area. During the reporting period, the Israeli forces killed a Palestinian civilian, and wounded 342 civilians, including 60 children, 4 women, 6 journalists, and 3 paramedics. The injury of 14 of them was reported serious. Moreover, 2 civilians were wounded during an Israeli airstrike. In the West Bank, a Palestinian civilian was killed and 6 Palestinians were wounded by the Israeli forces in separate shooting incidents. In the Gaza Strip, on 23 October 2018, the Israeli forces killed Montaser al-Baz (18), from al-Nussairat after being with a bullet to the head while participating in the Return and Breaking the Siege. As part of the use of lethal force against the peaceful protestors along the border fence during the reporting period, Israeli forces wounded 342 civilians, including 60 children, 4 women, 6 journalists and 3 paramedics. Fourteen of them sustained serious wounds. As part of targeting Palestinian fishermen in the Gaza Sea, the Israeli forces continued to escalate their attacks against the Palestinian fishermen, pointing out to the ongoing Israeli policy of targeting their livelihoods. During the reporting period, the Israeli forces opened fire 5 times at the fishermen; 2 incidents in the north-western Beit Lahia; 1 off al-Sudaniyah shore in western Jabalia in the northern Gaza Strip; 1 in al-Sheikh ‘Ejleen, south of Gaza City; Deir al-Balah in the Central Gaza Strip. As a result of those attacks, 6 fishermen were arrested while 2 boats were confiscated. As part of the Israeli airstrikes, on 19 October 2018, the Israeli drones launched 2 missiles at a group of Palestinians in an olive field, west of the Return encampment in Khuza’ah, east of Khan Younis. As a result, 2 civilians were wounded. On 20 October 2018, an Israeli drone launched a missile at a motorbike “Tok Tok” in eastern al-Fokhari, southeast of Khan Younis in the southern Gaza Strip. As a result, the motorbike burned but no causalties were reported. In the 2 incidents, the Spokesperson of the Israeli Forces declared targeting a cell launching incendiary Balloons at the Israeli communities adjacent to the southern Gaza Strip. On 24 October 2018, Israeli drones launched 2 missiles; only minutes between each, at a border control point belonging to the Palestinian armed Groups in eastern al-Shokah village, east of Rafah City in the southern Gaza Strip. However, no casualties were reported. As part of targeting the border areas, on 08 October 2018, the Israeli forces opened fire at the agricultural lands along eastern al-Shokah village, east of Rafah City in the southern Gaza Strip. However, no casualties were reported. In the West Bank, as part of use of lethal force against Palestinian civilians, on 24 October 2018, the Israeli forces killed a Palestinian civilian and wounded 3 others in Tamoun village, southeast of Tubas. This happened when the Israeli forces moved into the above-mentioned village from all its entrances and patrolled their vehicles. Thus, dozens of Palestinian youngsters and young men gathered to throw stones and Molotov Cocktails at the Israeli soldiers who then heavily fired live and rubber-coated metal bullets and teargas canisters. During the reporting period, the Israeli forces wounded 6 Palestinian civilians in spate shooting incidents. During the reporting period, Israeli forces conducted at least 84 military incursions into Palestinian communities in the West Bank and 6 similar ones into Jerusalem and its suburbs. During those incursions, Israeli forces arrested at least 35 Palestinians, including 8 children, in the West Bank. Meanwhile, 12 other civilians, including 2 children, were arrested in Jerusalem and its suburbs. Among those arrested in Jerusalem was the Governor of Jerusalem, ‘Adnan Gheith, and Director of the Palestinian Intelligence Service in Jerusalem, Colonel Jihad al-Faqih, who were both arrested on 20 October 2018 and released on 22 October 2018. As part of the Israeli house demolitions and notices, on 21 October 2018, the Israeli forces handed 3 civilians from al-Waljah village, west of Bethlehem, notices to stop the construction works in their houses in Khelet al-Samak and al-Thaher areas under the pretext of building without a license. It should be noted that an Israeli force accompanied with Jerusalem Municipal staffs moved into “‘Ein Jweizah” area, northwest of the village on 18 October 2018 and handed Najlaa’ Abu al-Haiijaa’ a notice to demolish her inhabited house which is 120 square meters. Moreover, they handed ‘Alaa’ Salim Abu Rezeq a decision to destroy retaining walls. As part of the attacks on the holy sites, on Wednesday morning 24 October 2018, the Israeli forces suppressed a sit-in organized upon calls from Coptic Bishop Anba Antonius in front of Deir al-Sultan Monastery next to the Church of the Holy Sepulchre in occupied East Jerusalem’s Old City to protest the Israeli-led restoration works at the site which they say favour Ethiopian monks living in the monastery and arrested a monk. As part of demolition of houses and other civil objects, on 18 October 2018, the Israeli forces demolished a 4-storey building in the Tall Mount Area, east of al-Bireh under the pretext of un-licensed building. The building was established on area of 145 square meters and belonged to Khamis Jamil ‘Abed Matariyah. 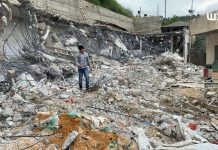 On the same day, the Israeli forces demolished an agricultural shed in Kherebet al-Marajem, east of Doma village, southeast of Nablus. The shed was built of bricks and roofed with tin plates on an area of 60 square meters. It belonged to Musalam Ma’rouf Musalam and used for agricultural purposes. On 22 October 2018, the Israeli forces demolished 3 water wells and levelled 15 dunums; part of which were planted with olive trees in Kherebet Jamrourah, west of Tarqoumia village, west of Hebron. On 23 October 2018, the Israeli forces dismantled 2 mobile houses in Bazeeq area in the northern Jordan Valleys, east of Tubas and confiscated them. The houses are used as 2 rooms for the school principle and staff in al-Tahadi 10 School. The Principle was also handed a demolition notice for the school and another for confiscation of school contents in addition to a third notice to suspend classes in the Abovementioned School. As part of the Israeli settlers’ attacks against the Palestinians civilians and their property, on 18 October 2018, a group of settlers under the protection of the Israeli forces attacked al-Safafir area, east of ‘Orif village, south of Nablus. On 20 October 2018, another group under the protection of the forces attacked Khelet Abu al-‘Aqareb area, east of Burin village, south of the city. The settlers threw stones at a house belonging to Bashir al-Zeben and removed the iron fencing established around the house outside fence to protect them from the settlers’ attacks. Due to the attack, the windshield of the car belonging to the coordinator of the Popular Committee against the Wall was broken. On 22 October 2018, a group of settlers attacked Marda village, nrth of Salfit, and punctured tires of 7 cars parked in front of the houses. At approximately 00:45, Israeli forces moved into Ertah Suburb, south of Tulkarm. They raided and searched house belonging to Monther Mohammed Mansour ‘Ashour (30) and then arrested him. Around the same time, Israeli forces moved into Noor Shams refugee camp, east of Tulkarm. They raided and searched a house belonging to Walid ‘Isam ‘Asfour (25) and then arrested him. At approximately 01:00, Israeli forces moved into al-Ma’ajin neighborhood, west of Nablus. They raided and searched a house belonging to Tareq ‘Adnan Salman al-Samhan (31) and then arrested him. The Israeli forces distributed statements threatening to shelter Ashraf Na’alwah saying: “Whoever helps Ashraf Na’alwah whether by providing him food, drink, transportation or shelter, will be held accountable, his house will be demolished without hesitation and all permits related to him and his family members will be canceled.” It should be noted that the Israeli forces chasing Na’alwah since 07 October 2018, as they accuse him of carrying out a shooting attack in Barkan Industrial area, west of Salfit. At approximately 02:00, Israeli forces moved into Beit ‘Awa village, southwest of Dura, southwest of Hebron. they raided and searched 2 houses belonging to Murad Riyad al-suweiti (28) and Anas ‘Ali al-Najjar (33) and then arrested him. Note: During the aforementioned day, Israeli forces conducted (14) incursions in the following areas and no arrests were reported: Beit Ummer, Surif, Taffuh, al-Majd villages and Yatta in Hebron; Baqa al-Sharqiyah, ‘Atil, Zeta, Nazlet Abu al-Nar, Nazlet ‘Essa, Beit Led, Safarin villages in Tulkarm; ‘Azzoun and Hejjah villages in Qalqiliyah. At approximately 17:25, an Israeli drone fired 2 missiles at a group of Palestinian civilians in and olive field, west of the Return encampment in Khuza’ah village, 800 meters to the east of Khan Younis. As a result, 2 civilians were wounded. The israeil forces spokesperson announced that the Israeli forces targeted a group of young men, who fired incendiary balloons at the Israeli compounds adjacent to the southern Gaza Strip. Note: During the aforementioned day, Israeli forces conducted (9) incursions in the following areas and no arrests were reported: ‘Ourif and Kufor Qalil villages, south of Nablus, Halhoul, al-Fawar refugee camp and Beit Kahel village, in Hebron; Zeta village, north of Tulkarm; Beit Led village, east of the city; Qalqiliyah; ‘Azzoun village, east of the city. At approximately 01:30, Israeli gunboats stationed offshore, adjacent to Deir al-Balah shore in the central Gaza Strip, opened fire and pumped wastewater at Palestinian fishing boats sailing within 4 nautical miles and chased them. As a result, one of the searchlight holders in a fishing boat fell on the head of Mohammed Nabil Nayef al-Aqra’a (32), from Deir al-Balah, causing him minor wounds. The fishermen were also forced to flee fearing for their lives. At approximately 03:00, Israeli forces accompanied with a large number of military vehicles moved into Shweikha Suburb, north of Tulkarm amidst random firing of sound bombs and tear gas canisters. They raided and searched a house belonging to Qusai ‘Imad Abu Saleh (16) and then arrested him. The soldiers also raided and searched ‘Ali Naifah School, which is an under construction school. The soldiers thought that Ashraf Na’alwah is hiding inside the school. At approximately 04:00, Israeli forces moved into Taqou’a village, east of Bethlehem. They raided and searched a house belonging to former prisoner Mohammed Husein al-Badan (21) and then handed him a summons to refer to the Israeli Intelligence Service in “Gush Etzion” settlement complex, south of the city. It should be noted that Mohammed al-Badan was released a week ago after serving his sentence in the Israeli jails. At approximately 04:45, Israeli gunboats stationed offshore, northwest of al-Waha resort, northwest of Beit Lahia in the northern Gaza Strip, heavily opened fire at Palestinian fishing boats. The Israeli gunboats surrounded a fishing boat manned by Karim Wahid Husein Abu Hassan (29) and his brother Mohammed (27), from al-Twam neighborhood in Jabalia. The boat was sailing within 3 nautical miles and about 3 kilometers into the south of the northern border water between the Gaza Strip and Israel. The soldiers forced the fishermen to take off their clothes, jump into the water and swim towards the gunboats. The fishermen were arrested and taken to Ashdod Seaport and their boat was confiscated. At approximately 14:30, Israeli authorities released the abovementioned fishermen via Beit Hanoun “Erez” crossing while kept the boat under custody. At approximately 12:50, Israeli forces moved into Deir al-Ghusoun village, east of Tulkarm. They raided and searched a house belonging to Mohammed ‘Adnan al-Tabbal (22) and then arrested him. Note: During the aforementioned day, Israeli forces conducted (6) incursions in the following areas and no arrests were reported: ‘Ourif village, south of Nablus; Yatta and Hebron; Bal’a village, north of Tulkarm; Beit Led village, east of the city; ‘Azzoun village, east of Qalqiliyah. At approximately 00:45, Israeli forces moved into Kufor Thuluth village, east of Qalqiliyah. They raided and searched a house belonging to Nasser theeb ‘Oudah (47) and then arrested him. Note: During the aforementioned day, Israeli forces conducted (9) incursions in the following areas and no arrests were reported: ‘Ourif, Kufor Qalil and Sebastia villages in Nablus; Sa’ir, Beit ‘Aninoun villages ad al-Fawa refugee camp in Hebron; Tulkarm, Shweikha Suburb and al-Jaroushiyah village. At approximately 01:00, Israeli forces moved into Qabatiyah village, southeast of Tulkarm. They raided and searched a house belonging to Sameh Mohammed Kahlil Kamil (20) in al-Damouni Mount in the eastern neighborhood in the village, and then arrested him. At approximately 02:00, Israeli forces moved into Rojeeb village, east of Nablus. They raided and searched a house belonging to Mo’atasem Jamal Rawajbah (22) and then arrested him. Around the same time, Israeli forces moved into al-Laban eastern village, south of Nablus. They raided and searched a house belonging to Khalid Abdul Jabbar Daraghmah (21) and then arrested him. At approximately 03:00, Israeli forces moved into al-Khader village, south of Bethlehem. Thy raided and searched 2 houses belonging to Ahmed Habas Salah (31) and Lutfi Salah Eden Salah (33) and then arrested him. At approximately 04:00, Israeli forces accompanied with 2 military vehicles moved into al-Am’ari refugee camp, south of Ramallah. They raided and searched a house belonging to Na’el Mahmoud Abu Kuwaik (37) and then arrested him. It should be noted that Abu Kuwaik was a former prisoner at the Israeli jails where he spent 5 consecutive years of imprisonment. Around the same time, Israeli forces moved into Kufor Ne’mah village, west of Ramallah. They raided and searched 2 houses belonging to Khalid Khaldoun al-Deek (20) and Yazan Mohammed Dar ‘Essa (20) and then arrested him. Note: During the aforementioned day, Israeli forces conducted (5) incursions in the following areas and no arrests were reported: Tal village, southwest of Nablus; Surif, al-Shuyoukh, Deir Razeh village and al-‘Aroub refugee camp in Hebron. At approximately 02:00, Israeli forces moved into Beit Ummer village, north of Hebron and stationed in Beit Za’atah neighborhood. They raided and searched a house belonging to Mohammed Khalid Abdul Hamid Sabarnah (23) and then arrested him. Around the same time, Israeli forces moved into Qalqiliyah. They raided and searched a number of houses after which they arrested 3 civilians namely Sajed Walid Jebril (14), Ahmed Salah al-Qadoumi (17) and his brother ‘Ezz Eden al-Dayem (18). Around the same time, Israeli forces moved into al-Dawhah village, west of Bethlehem. They raided and searched a number of houses. Meanwhile, a number of Palestinian youngsters gathered and threw stones and empty bottles at Israeli soldiers. The soldiers fired live and rubber bullets, sound bombs and tear gas canisters at them. As a result, a civilian was hit with a live bullet to the right foot. The Israeli soldiers also arrested Mahmoud Salah al-Hamash (17). At approximately 04:20, Israeli forces moved into al-Moghir village, west of Bethlehem. They raided and searched a number of houses and then arrested Mousa Ahmed Najajrah (14) and Mohammed No’man Shakarnah (16). At approximately 05:20, Israeli gunboats stationed offshore, adjacent to al-Sudaniyah area, west of Jabalia in the northern Gaza Strip, sporadically opened fire at Palestinian fishing boats sailing within 4 nautical miles and chased them. As a result, the fishermen were forced to flee fearing for their lives, but neither casualties nor material damage was reported. At approximately 06:00, Israeli gunboats stationed offshore, northwest of al-Waha resort, northwest of Beit Lahia in the northern Gaza Strip, heavily opened fire at Palestinian fishing boats. The Israeli gunboats surrounded a fishing boat manned by ‘Awad Nafeth Abdul Malek al-sultan (22), from al-Salatin neighborhood in Beit Lahia, and Ahmed ‘Emad Mahmoud Siyam (21), from al-Shati’a refugee camp, west of Gaza City. The fishing boat was sailing within 2 nautical miles and about 3000 meters into the south of the northern border water between the Gaza Strip and Israel. The Israeli naval soldiers forced the fishermen to take off their clothes, jump into the water and swim towards the gunboats. The fishermen were arrested and taken to Ashdod Seaport and their boat was confiscated. At approximately 07:10, Israeli forces moved into Abdu Mash’al village, northwest of Ramallah. They raided and searched several houses after which they arrested 3 civilians, including a child, namely Fawzi Maher Zahran (19), Faraj Abdul Qader al-Barghuthi (22) and Mustafa Riyad Taha (17). At approximately 13:00, Israeli gunboats stationed offshore, adjacent to Sheikh ‘Ejlin, south of the city, opened fire at a Palestinian fishing boat sailing within 4 nautical miles and chased it. The boat was manned by Mahmoud Mohamed Ibrahim Meqdad (35) and Husein Suheil Hasan Meqdad (26), from al-Shati’a refugee camp, west of Gaza City. The Israeli gunboats surrounded the boat and the soldiers forced the abovementioned fishermen to take off their clothes, jump into water and swim towards one of the gunboats. The soldiers then arrested them and took them to Ashdod Seaport. At approximately 19:00 on the same day, the Israeli forces released the fishermen via Beit Hanoun “Erez” crossing in the northern Gaza Strip. Note: During the aforementioned day, Israeli forces conducted (10) incursions in the following areas and no arrests were reported: Nablus and Sebastia village, northwest of the city; Rojeeb, al-Laban eastern village; Kufor Qalil, Beit Ummer, Bani Na’im, Shuyoukh, al-‘Aroub and al-Surrah villages and Halhoul. At approximately 01:00, Israeli forces moved into Beit Led village, east of Tulkarm. They raided and searched a number of houses and then arrested 3 civilians, including a child, namely Muhanned Abdul Karim Kou’a (47), his son Jamal (17) and Mahdi Adeeb Qasem al-Haj Ibrahim (26). Around the same time, Israeli forces moved into Shuweikah Suburb, north of Tulkarm. They raided and searched a number of houses and then arrested 3 civilians namely Mohammed Feras Mahdawi (20), Hamam Omer al-Masri (19) and Ibrahim Husein al-Mahdi (22). Around the same time, Israeli forces moved into Kufor Laqef village. They raided and searched a house belonging to Rami Yusuf Ghazawi (26) and then arrested him. In a new crime of excessive use of lethal force against Palestinian civilians, Israeli forces killed a Palestinian civilian and wounded 3 others in Tamoun village, southeast of Tubas. This crime and other killings lately committed by the Israeli forces prove that the Israeli forces deliberately aiming at inflicting the highest number of casualties among Palestinian civilians. According to investigations conducted by the Palestinian Center for Human Rights (PCHR), at approximately 01:30 on the abovementioned day, Israeli forces accompanied with a number of military vehicles moved into Tamoun village, southeast of Tubas, from all its entrances and patrolled the streets in order to carry out arrest campaigns. They raided and searched several houses. Meanwhile, dozens of Palestinian youngsters and young men gathered and threw stones, empty bottles and Molotov Cocktails at Israeli soldiers. The soldiers heavily fired live and rubber bullets and tear gas canisters at them. At approximately 03:15, the clashes intensified in al- al-Jadeed intersection area, east of the village. At approximately 03:30, about 4 to 5 Israeli soldiers surprisingly went out of Bani Theeb Cemetery, which is about 40 meters away from the abovementioned intersection, and heavily and randomly opened fire at the protestors. As a result, Mohammed Mahmoud Busharat (22) was hit with a live bullet that penetrated the lung and exited the back. Mohammed fell down near an ambulance belonging to the Palestine Red Crescent Society (PRCS), which immediately took him to Tubas Turkish Hospital in Tubas as he was in a very serious status. Mohammed was then transferred to Al-Razi Hospital in Jenin. Mohammed died at the Emergency Department of the abovementioned hospital and his death was announced after a short time of his arrival at the hospital. Moreover, 3 civilians were wounded. A 25-year-old civilian was hit with 2 live bullets to the left thigh and one of them was hit to the aorta. The civilian was taken to Tubas Turkish Hospital and then transferred to An-Najah National Hospital in Nablus because he needed a surgery in his blood vessels. Furthermore, a 33-year-old civilian was hit with a live bullet to the right side of buttock; and a 22-year-old civilian was hit with a live bullet to the right foot. The 2 civilians wounded were transferred to Tubas Turkish Hospital and doctors classified their injuries as moderate. It should be noted that Busharat is a fourth year student at al-Quds Open University. At approximately 02:00, Israeli forces moved into Qifin village, north of Tulkarm. They raided and searched a house belonging to Amjad ‘Azmi Yusuf ‘Ammar (24) and then arrested him. At approximately 03:00, Israeli forces moved into al-‘Ezzah refugee camp, north of Bethlehem. They raided and searched a house belonging to Husein Jalal Husein Masalmah (22) and then arrested him. At approximately 15:45, Israeli drones fired 2 missiles, with few minutes between each of them, at border control point belonging to Palestinian armed groups, east of al-Shawkah village, east of Rafah in the southern Gaza Strip, but no casualties were reported. Note: During the aforementioned day, Israeli forces conducted (5) incursions in the following areas and no arrests were reported: Salem, village, east of Nablus; Qusin village, west of the city; Nuba, Bani Na’im and al-Burj villages in Hebron. The Northern Gaza Strip: 66 civilians, including 25 children and an old lady, were wounded. Fifty three of them were hit with live bullets and their shrapnel and 13 were hit with tear gas canisters. Doctors classified injury of 4 civilians as serious. Mai Nasser Labad wallababdah (21), a volunteer paramedic at the Palestinian Ministry of Health, was hit with a rubber bullet to the left arm. Hasan Nather Hasan Abu Sa’adah (31), a paramedic at the Civil Defense, was hit with a rubber bullet to the left eye. Husein Abdul Jawad Husein Jarbou’a (43), a journalist at “Global Media”, was hit with a rubber bullet to the neck. Ahmed Walid Khalid al-Halabi (21), a reporter at ” Kan’aniyat News Agency”, was hit with a rubber bullet to the hand. Yahiya Walid Khalid Heles (21), a reporter at Palestine Today Agency, was hit with a tear gas canister to the face. Mohammed Nahrou Abdul Karim al-Thalathini (26), a freelance photojournalist at Deutsche Presse Agentur (DPA), was hit with a shrapnel to the head. Fadi Wahid Hamad Thabet (28), a freelance journalist from Gaza Valley village, was hit with a live bullet to the left leg. Mahmoud Zakaria Mohammed Musalam (23), a journalist at al-Hadath Newspaper from al-Maghazi, was hit with a live bullet to the right ankle. Khan Younis: 44 civilians, including 8 children, a woman and a volunteer paramedic, were wounded. Thirty six of them were hit with live bullets and their shrapnel and 8 were hit with tear gas canisters. Doctors classified 3 civilians’ injuries as serious. The wounded journalist was identified as Hasan Rateb Hasan al-‘Esawi (40), a volunteer paramedic at “Rozan” Medical Team, was hit with a live bullet to the right leg. Rafah City: 15 civilians, including 7 children and 2 women, were wounded. Fourteen of them were hit with live bullets and their shrapnel and one female civilian was hit with a tear gas canister. Doctors classified one civilian’s injury as serious. At approximately 15:00 on Monday, 22 October 2018, Israeli gunboats stationed offshore, and Israeli forces stationed along the border fence between the Gaza Strip and Israel, opened fire and fired sound bombs at dozens of Palestinian civilians who were at the Return camp along the border coastal, adjacent to adjacent to “Zikim” military base , northwest of Beit Lahia in the northern Gaza Strip. It should be noted that this is the 13th time for Palestinian boats to sail for Breaking the Siege. As a result, 60 civilians, including 15 children, were wounded. Forty six of them were hit with live bullets and their shrapnel and 14 were hit with tear gas canisters. Doctors classified 4 civilians’ injuries as serious. On Tuesday, 23 October 2018, Israeli forces killed Montaser Mohammed Ismail al-Baz (18), from al-Nuseirat, after he sustained a live bullet wound to the head during his participation in the March of Return and Breaking Siege, east of Deir al-Balah in the central Gaza Strip. al-Baz was taken to al-Aqsa Hospital in Deir al-Balah, but due to his serious health condition, he was transferred to al-Shifa Hospital in Gaza City. At approximately 20:20, medical sources at al-Shifa hospital announced his death. Moreover, 7 civilians were wounded and doctors classified a civilian’s injury as serious. On the same day, a 26-year-old civilian was hit with a live bullet to the foot, adjacent to the Return encampment, east of Khuza’ah village, east of Khan Younis. 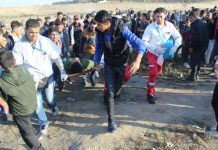 On Wednesday evening, 24 October 2018, 7civilians, including journalist Anas Rawhi Abdullah al-ghoul (21), were hit with live bullets and their shrapnel during their participation in the March of Return activities established in the east of al-Shawkah village, east of Rafah in the southern Gaza Strip. At approximately 15:30 on Friday, 19 October 2018, Palestinian civilians organized a demonstration in the center of Qalqiliyah and headed to the western entrance to the city Israeli forces charged with guarding the annexation wall, adjacent to al-Naqqar neighborhood (the western entrance) fired rubber bullets, sound bombs and tear gas canisters at the protestors. As a result, a 25-year-old civilian was hit with a rubber bullet. Note: PCHR could not get the numbers relevant to the movement at Beit Hanoun “Erez” Crossing for technical reasons. On Friday, 19 October 2018, Israeli forces established a checkpoint at the intersection of “Homesh “ settlement, northwest of Nablus, arrested ‘Emad Mahmoud ‘Amarnah (26), from Qafeen village, north of Tulkarm. On the same day, Israeli forces satiobed at Z’atarah checkpoint, south of Nablus, arrested ‘Alaa ‘Ahed Jaber (24), from Beit Lid village, east of Tulkarm. At approximately 17:00 on Friday, Israeli forces stationed at Za’tara checkpoint, south of Nablus, arrested Nazir Ahmed Ja’ar (46), from Tulkarm. On Saturday, 20 October 2018, Israeli forces established a checkpoint at the intersection of Beit Lid village, east of Tulkarm, and then arrested Murad ‘Esam al-A’raj (25), from ‘Inbitah village, east of the city. At approximately 20:30 on Sunday, 21 October 2018, Israeli forces stationed at Jabarah checkpoint, south of Tulkarm, arrested Mohamed ‘Ibrahim Kharsah (22), from Showika suburb, north of the city. At approximately 14:00 on Monday, 22 October 2018, Israeli forces stationed at Hawarah checkpoint, south of Nablus, arrested Nabil Ahmed Hamayil (42), from Bita village, south of Nablus, while passing through the checkpoint. The Israeli forces claimed that he was attempting to carry out a stabbing attack at the abovementioned checkpoint. On Tuesday, 23 October 2018, Israeli forces stationed at the entrance to Amateen village, east of Qalqiliyia, arrested Huthifah ‘Abed al-Naser As’ad Ghanem (19), from Amateen village. At approximately 11:00, Israeli forces deployed in the Old City neighborhoods and in the vicinity of al-Ibrahimi Mosque arrested Wadee’ Mohamed Abu Turki (14), claiming that he had a knife. Wadee’ was then taken to an investigation center in “ Kiryat ‘Arba’” settlement. At approximately 16:00 on Tuesday, Israeli forces arrested Mohamed Mashour Hamarah, a trainee journalist, from Hosan village, west of Bethlehem, while taking photos of a group of civilians, who were waiting in front of the Israeli Civil Administration Gates in order to get a work permit. He was arrested under the pretext of taking photos of a military site. On the same day evening, he was released after being questioned for few hours. At approximately 20:00, Israeli forces closed all the entrances leading to Halhoul village, north of Hebron, claiming of opening fire at a military jeep. This coincides with placing metal detectors at the entrance to al-Hawour Road. The Israeli forces searched Palestinian civilians’ vehicles, checked the passengers’ IDs and then arrested Mahdi Taha ‘Abed al-Hadi (30), Nadeem Yousef Saymah (28), and Mohamed Hussain Haneehan (29). On Wednesday, 24 October 2018, Israeli forces stationed at Abu al-Rish military checkpoint in the southern area of Hebron, was arrested Ahlam Yousef Khallaf (28). The Israeli forces claimed that she had a knife. It should be noted that Ahlam works as a teacher in a private school on Tareq Bin Ziyad Street. At approximately 03:00 on Thursday, 18 October 2018, Israeli forces moved into occupied East Jerusalem’s Old City. They raided and searched a house belonging to Kamal Abu Qowadir (51) and then arrested him. At approximately 05:00 on Thursday, Israeli forces moved into Wadi al-Jouz neighborhood, east of occupied East Jerusalem’s Old City. They raided and searched houses, from which they arrested Fadi Motawer (36) and ‘Abdullah Hasan ‘Alqam (52). At approximately 08:00 on Saturday, 20 October 2018, Israeli forces arrested Jehad al-Faqeih (50), Director of the Palestinian Intelligence Service in Jerusalem after stopping his car while heading to his work. Shadi al-Motawer, Secretary of Fatah Movement in Jerusalem, said that the Israeli forces arrested Jehad at a military checkpoint established near al-Jadirah village, northwest of occupied Jerusalem. Jehad was then taken to al-Maskobiyia investigation center in West Jerusalem. At approximately 19:00 on Saturday, Israeli forces arrested Jerusalem’s Governor, ‘Adnan ‘Adel Tawfiq Gheith (46), while he was in his car in Beit Haninah village, north of occupied East Jerusalem. Eyewitnesses said that 3 vehicles belonging to the Israeli police intercepted the governor’s car and then kidnapped him. It should be noted that ‘Adnan was appointed as a Jerusalem’s governor in late August. On Monday, 22 October 2018, the Israeli police released the Jerusalem’s governor and director of the Intelligence Service from al-Maskobiyia Police Station after the District Court’s judge decided to release the Jerusalem’s governor condition that he will be subject to house arrest and moved away his house in Silwan village for one week, in addition to paying a fine of around NIS 20.000. The Public Prosecution called for freezing the decision until 18:00 in order to discuss the possibility of filing an appeal to the Supreme Court, but the Public Prosecution retreated from its demand, so he was released on Monday evening. At approximately 03:00 on Sunday, 21 October 2018, Israeli forces moved into Sho’fat refugee camp, north of occupied East Jerusalem. They raided and searched a house belonging to Sharhabil Hasan ‘Alqam (48) and then arrested him. At approximately 01:00 on Monday, 22 October 2018, Israeli forces moved into Kafur ‘Oqoub village, north of occupied East Jerusalem. They raided and searched a house belonging to Saied Adeeb ‘Aboushi (37) and then arrested him. At approximately 01:00 on Wednesday, 24 October 2018, Israeli forces moved into al-‘Issawiyia village, northeast of occupied East Jerusalem. They raided and searched houses, from which they arrested 3 civilians, including 2 children. The arrested civilians were identified as Ahmed ‘Abed al-Ra’ouf Mahmoud (17), Sameer Akram ‘Atiyah (16), and Adam Fadi Mostafa (19). At approximately 02:30 on Wednesday, Israeli forces moved into al-Ras neighborhood in Abu Dis village, east of occupied East Jerusalem. They raided and searched houses, from which they arrested Mohamed Saqer Salah (24) and Mo’az Ibrahim Rabie’ (23). At approximately 09:30 on Sunday, 21 October 2018, Israeli forces moved into al-Waljah village, west of Bethlehem. They notified 3 civilians to stop construction works in their houses located in Khelet al-Samak and al-Dohur, under the pretext of non-licensing. Activist Ibrahim ‘Awadallah said that the Israeli forces moved into the village and then stationed in Khelet al-Mayiah area as tightening security restrictions were imposed on the area. The Israeli soldiers deployed in the village neighborhoods and its main streets and then took photos of houses. The Israeli forces also handed 3 notices to stop construction works for 3 civilians; one of them was identified as Hasan Mostafa Salah, who was notified to stop construction works in his 120-square-merter house, which is in al-Dohur area. It should be noted that on late Thursday, an Israeli force accompanied with a Jerusalem Municipal staff moved into ‘Ain Jowizah area, northwest of the village, and then handed Najlaa Abu al-Hijaa’ a notice to demolish his inhabited house built on an area of 120 square meters. They also handed ‘Alaa Saleem Abu Rezeq a notice to demolish his retaining walls. At approximately 09:00 on Wednesday, 24 October 2018, Israeli forces suppressed a sit-in protest organized by Coptic Bishop Anba Antonius in front of al-Sultan monastery, next to the Sepulcher Church in occupied East Jerusalem’s Old City. The sit-in protest was organized to oppose the Israeli-led restoration works at the monastery in favor of the Ethiopian monks. Eyewitnesses said that the Israeli forces beat and pushed the monks of the Coptic Church and forcibly disperse them from the entrance to the al-Sultan monastery in so that the Israeli Municipality staff could enter and conduct restoration works. The eyewitnesses also said that the Israeli forces detained and handcuffed a monk identified as, Macarius Orshalemy, for few hours after beating him. The Coptic Orthodox Patriarchate in Jerusalem organized the sit-in after the Israeli authorities refused to allow the Coptic Church to carry out the restoration works in al-Sultan monastery. The Israeli Municipality conducts restoration works inside al-Sultan monastery in favor of Ethiopian monks without getting any approval from the church. The Patriarchate pointed out in a statement that the restoration works violate Status Que Agreement and seek to erase the identity of the Coptic Monastery. The Coptic Bishop in Jerusalem along with Orshalemy issued a statement stating that the sit-in was peaceful and organized to protest the Israeli forces’ entering construction materials for carrying out the restoration works without getting the approval from the church. The Israeli forces violently beat the monks participating in the protest. The Coptic Bishop in Jerusalem and Orshalemy said that they continuously contacted the Egyptian Embassy, His Holiness Pope Tawadros II and Coptic Orthodox Church of Alexandria, to see the latest developments. He pointed out that the sit-in protest was fully peaceful to demand the Coptics’ rights as owners of the monastery and legal solutions will be sought, in addition to contacting the Egyptian Ministry of Foreign Affairs in order to solve the matter in a diplomatic way. He also pointed out that the Coptic Orthodox Church will never leave the monastery because it is the original property of Egypt and the Egyptians. He added that the Israeli forces attacked the monks and did not respect the peaceful protest or the fact that they are clerics. The Monastery of the Sultan is an ancient monastery of the Orthodox Copts located inside the walls of the Old City of Jerusalem in the Christian neighborhood next to the Church of St. Helena, the Church of the Angel and the passage from the Church of Helena to the Wall of Sepulcher Church and built on an area of 1800 square meters. At approximately 03:30 on Thursday, 18 October 2018, Israeli forces backed by military vehicles and accompanied with a vehicle of the Israeli Civil Administration, 3 diggers and 2 bulldozers moved into al-Bireh and then stationed in the vicinity of Majed As’ad Stadium in al-Taweel Mount area. The Israeli forces surrounded a 4-storey building and imposed a security cordon on the area. They also prevented anyone from approaching even the house owner. The Israeli vehicles and bulldozers completely demolished the building under the pretext of non-licensing. It should be noted that the 145-sqaure-meter house belongs to Khamis Jameel ‘Abed Matriyia. At approximately 05:00 on Thursday, Israeli forces backed by military vehicles and accompanied with a vehicle of the Israeli Civil Administration and a bulldozer moved into Kherbit al-Marajem, east of Duma village, southeast of Nablus. 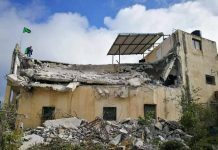 The Israeli bulldozer demolished a 60-square-meter agricultural barrack built of bricks and roofed with tin plates. The barrack belonged to Musallam Ma’rouf Saleem Musallam. It should be noted that it was the second time that this barrack was demolished, as it was previously demolished on 15 July 2018. The abovementioned barrack was used for storing agricultural tools. At approximately 10:40 on Thursday, 18 October 2018, a group of Israeli settlers, protected by the Israeli forces, from “Yatizhar” settlement, moved into al-Safafeer area in the eastern side of ‘Oreef village, south of Nablus. The Israeli settlers threw stones at ‘Oreef secondary school; meanwhile, a group of Palestinian young men gathered and threw stones at the Israeli forces and settlers. After that, the Israeli forces fired live and rubber bullets and tear gas canisters at them. As a result, a 26-year-old male was hit with a live bullet to the right thigh and was then taken to Rafidia Hospital in Nablus, where his injuries were classified as moderate. At approximately 11:00 on Saturday, 20 October 2018, a group of Israeli settlers, protected by the Israeli forces, from “Kafat Ronim“ settlement extended from “Bracha “ settlement, moved into Khelet Abu al-‘Aqareb area in the eastern side of Bureen village, south of Nablus. The Israeli settlers threw stones at a house belonging to Bashir Hamza al-Zebin and then removed iron fencing placed on the house wall that was donated by the Popular Committee against the Wall and placed on the wall on the same day morning. The Israeli settlers attacked the representatives of the Popular Committee against the Wall and threw stones at the windshield of a car belonging to Jamal Yousef Jum’a, the Committee’s coordinator. It should be noted that the car was with an Israeli registration plate. At approximately 03:00 on Monday, 22 October 2018, a group of Israeli settlers attacked Merda village, north of Salfit, and then punctured the tiers of 7 vehicles parked in front of houses. The vehicles belong to Omar Sedqi Khafash, Nash’at Khafash, Hussain Hasan Sa’ied, Ahmed Saleh Ibdah, Sameeh Indah, Mohamed Ibdah, and Sa’ied Taha Ibdah. The Israeli settlers also wrote racist slogans against Arabs on the vehicles.